Delta, Surrey or Tsawwassen First Nation as possible host city. Jul. 7, 2016 11:00 a.m.
Staff at the Corporation of Delta identified the Delta Town & Country Inn at the intersection of Highway 99 and Highway 17A as the only appropriate site for a gaming facility and entertainment complex in the municipality. 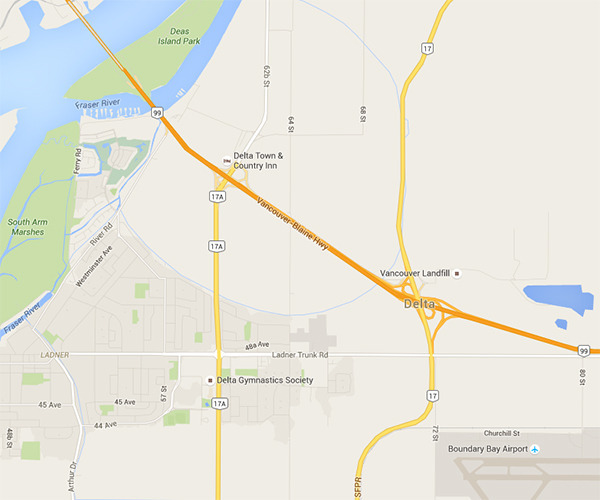 The Corporation of Delta is considering rolling the dice on a new casino in Ladner. On June 27, Delta council voted unanimously to submit a non-binding expression of interest for a gaming facility to the British Columbia Lottery Corporation (BCLC), a project that could net the municipality between $1.5 million and $3 million annually. Delta Mayor Lois Jackson received a letter from Brad Desmarais, vice-president of casino and community gaming at the BCLC, on June 1 inviting Delta to be considered as a host city for a new gaming facility in the south of the Fraser region of Metro Vancouver. The BCLC also initiated the expression of interest process with the City of Surrey and Tsawwassen First Nation. Interested local governments have until July 15 to respond. Ron Toigo of Shato Holdings Ltd., the owner of the Delta Town & Country Inn, expressed support for the corporation considering the property for the site of a new gaming facility and entertainment complex in a letter to the mayor dated June 16. Christine Ellerton has lived in Ladner for 18 years and runs Ladner Living, a Facebook page that brings area residents together to discuss community issues. She said it isn’t surprising that someone is looking to build a casino in Delta given what she sees as an overall trend towards development and expansion in the region. As for the recommended location, Ellerton said she likes that it’s removed from residential areas as no one wants a casino on their doorstep, but that some residents have shared with her their concern that a gaming facility and entertainment complex at that location may make an already terrible traffic situation worse. “I was talking about this yesterday with a few people in Ladner…[and] their knee jerk reaction was, ‘Oh my God, right at the mouth of the tunnel? '” Ellerton said, adding construction of the casino and the George Massey Tunnel replacement, especially if done simultaneously, could add to the gridlock. Harvie said a new gaming facility in a neighbouring jurisdiction could have similar community impacts as one in Delta, such as increased traffic and policing costs, but without the financial benefits. A BCLC background document included with Harvie’s report to council says a new facility in the region could generate between $25 million and $50 million in incremental revenue. Host local governments receive 10 per cent of net gaming income in their communities, meaning a casino could bring the Corporation of Delta about $1.5 million to $3 million per year. Harvie said revenue from a gaming facility in Delta would likely not go towards the corporation’s operating budget as the amount would be uncertain. However, he said, it would definitely save Delta taxpayers by having those funds accumulate to build legacy projects such as artificial fields and community centres, or to renovate some of the municipality’s aging buildings. According to BCLC documents included in Harvie’s report, the south of the Fraser region currently has approximately 460,000 adult residents and two existing gaming facilities: Elements Casino (formerly Fraser Downs) in Cloverdale and Newton Bingo Country.